Wrigley Field (then known as Weeghman Park) was just a few months away from opening its doors for the first time when a boy was born to Chicago sportswriter Bill Bailey and his wife. Bailey’s real last name was Veeck, and he named his son after himself, William Veeck Jr. The elder Veeck became the president of the Cubs when Bill Jr. was still a little boy, and was probably the greatest innovator of his time. He was the first man to bring Ladies Day to the big leagues, and was the first to realize how important it was to broadcast the games on the radio (The Cubs were the first team to do so). While other teams were afraid of giving away the product for free–Veeck Sr. saw it for what is was–a free 3 hour commercial for the team and the ballpark. At the age of 11, young Bill started helping out his dad at the ballpark. He worked on the grounds crew, as an office boy, and a vendor. 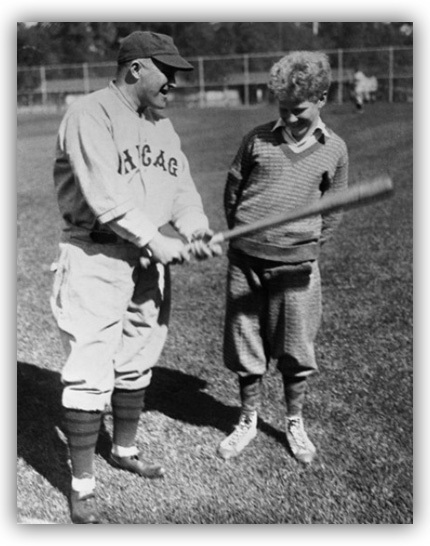 (Photo: Bill with manager Joe McCarthy) As a fifteen year old kid, he was taking care of the Ladies’ Day passes at Wrigley Field by day, and was tagging along with baseball hero Hack Wilson to the speakeasies in Cicero by night. “With a father who ran a ball club, my boyhood was the kind most kids dream about,” Veeck says in his autobiography. It’s no wonder that Wrigley Field meant so much to him. Young Bill wasn’t only hanging out with famous ballplayers like Wilson, Grover Cleveland Alexander, and Charlie Grimm, he really felt like he was part of the team. After his father died in 1933, Veeck quit college to work for the Cubs full-time. He eventually rose to the job of Treasurer, but when he wasn’t given the job of President a few years later, he moved on (in 1941). His most lasting accomplishment at Wrigley Field is something that still draws fans into the ballpark seventy years later…the ivy on the walls. Veeck was the one that planted the ivy in 1937. In his final years Veeck re-adopted the Chicago Cubs. He was a frequent sight at Wrigley Field, often found sitting in the bleachers without a shirt. He had owned several different teams in his long baseball career (The Browns, the Sox, the Indians, and the Brewers), but when he could go to any ballpark in the big leagues in any town in America, there was only one ballpark he came to again and again as a fan. He came home to his favorite place; the place of his childhood dreams, Wrigley Field. The country celebrates President’s Day every February, and Wrigley Field has hosted a few presidents over the years. President Taft’s brother Charles was the owner of the Cubs who sold the team to Charles Weeghman, the man who built Wrigley Field. President Taft saw the Cubs play three times, although none of those games were in the “new” ballpark. 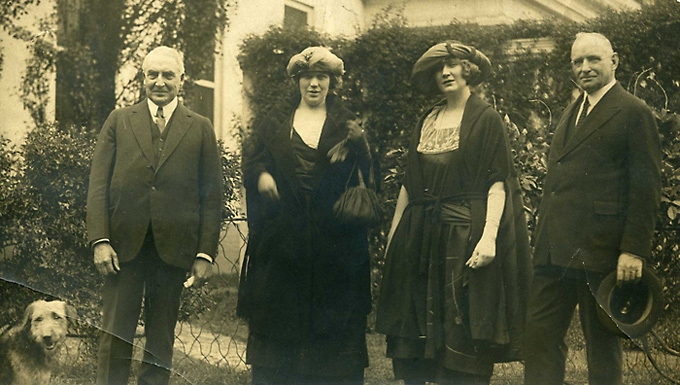 In 1920, Warren Harding came to see the Cubs as he campaigned for the presidency. He was friends with Cubs owner William Wrigley, and was very close to Cubs minority owner Harry Sinclair. After he won the presidency Harding even invited Cubs legend Cap Anson to visit him at the White House (photo). Unfortunately for Harding, Harry Sinclair later led him into the biggest scandal of his presidency, the Teapot Dome Scandal. (Note: Harding saw the Cubs play an exhibition game, and it also wasn’t at Wrigley Field, it was in Ohio). In 1932, Franklin Delano Roosevelt attended a World Series game at Wrigley Field. It was the day that Babe Ruth called his shot. Roosevelt was the Governor of New York at the time and was running for president. He watched the game seated next to Chicago mayor Anton Cermak, who would later take a bullet intended for the president. On September 30th, 1988, President Reagan attended a game at Wrigley Field. He threw out the first pitch, and broadcast an inning with Harry Caray. Reagan got his start in radio in the 1930s broadcasting Cubs games for WHO-Radio in Iowa. He was a life-long Cubs fan. On June 30th, 1999, President Bill Clinton watched a game from a skybox at Wrigley Field. It was four months after the Senate voted to acquit him on perjury and obstruction charges after he had been impeached by the House of Representatives. He got the job in 1916 when the Cubs first started playing in what is now known as Wrigley Field, and he kept the job until his death in 1974–an incredible streak of 59 years. When he first began, he had to do his job with a gigantic megaphone (this was before a public address system had been invented.) That’s a photo of him in action. He said the starting lineups to the crowd from third base, and then did the same thing on the other side of the field from first base. 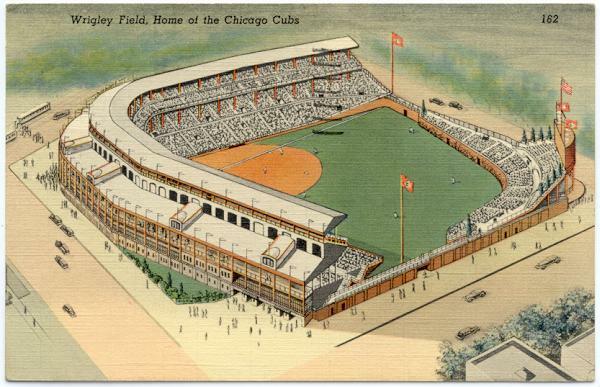 In 1932, the Cubs finally installed a public address system. Pieper sat next to the wall separating the field from the stands, between home plate and third base. He was responsible for picking up the straw hats that fans threw onto the field, but he was also there to shake the hands of Cubs players as they crossed home plate. He was sitting in that seat when Babe Ruth came up to bat in 1932, and Pieper is one of the few people who swore that Babe actually did call the shot. 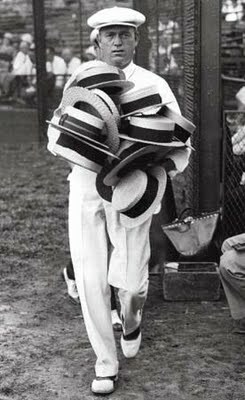 Pieper was the PA for 6 World Series, but he also handled those chores for the twenty consecutive seasons the Cubs finished in the bottom half of the league (1946-1966). When he died shortly after the 1974 season (October 22nd), the Cubs had just finished their most successful stretch since their World Series days. He was inducted into the Chicago Cubs Walk of Fame in 1996. Cubs owner Phillip K. Wrigley held a press conference at Wrigley Field to announce a brand new venture: The All-American Girls Baseball League. He thought that World War II would dilute major league talent so much, that the women’s league was a way to keep interest in the game, and give people another reason to come to the ballpark. It was also seen as a morale booster for the wartime American public. Wrigley had hoped to convince the other major league owners to also offer women’s teams to play in their ballparks on off-days, but no one else would follow. So, initial tryouts were held in Wrigley Field, and the league remained a Midwestern affair. Four teams played that first season; Rockford, South Bend, Racine and Kenosha. 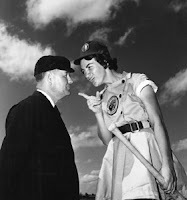 The league dissolved in 1954 when the number of women coming out for baseball began to decrease. Many post-war women opted for marriage and families instead. Still, the league was considered a great success. In 1948, at the peak of the league, nearly a million fans came out to the ballpark to watch women’s baseball. By the end of their eleven year run, the league had expanded to include teams in Milwaukee, Minneapolis, Grand Rapids, Fort Wayne, Springfield Illinois, Kalamazoo, Battle Creek, Muskegon, Peoria, and even Chicago. In fact, in a little known footnote to history, the All-American Girls League did something that men didn’t do for another forty-five years at Wrigley Field. 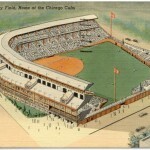 Temporary lights were installed in 1943, and the girl’s played the first night game in Wrigley Field history.